The ESP300m Roll Rewind Processor is the perfect solution for maintaining document security as well as increasing production between the print facility and the finishing department. The ESP 300m Roll Rewind Processor is the perfect solution for maintaining document security as well as increasing production between the print facility and the finishing department. 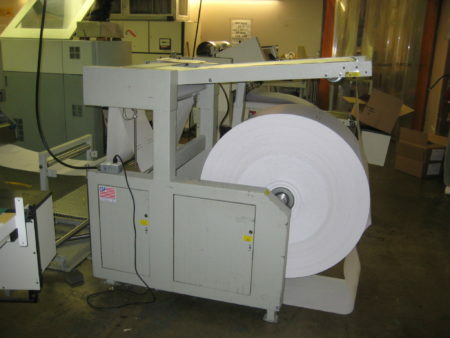 -Adjustable Electronic Tension Control produces tightly wound rolls with the ability to reduce tension for paper with weak perforations. Can be adjusted while the printer is running. 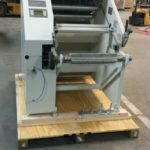 -Rewinds 52″ Diameter Rolls (up to 50,000 forms) on a single roll without operator intervention, reduces downtime on both the printer and the finishing equipment. 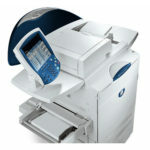 -Adaptable – – works with all electronic printers. -120 VAC 10A Electrical Supply* uses standard 120V outlet; no special wiring necessary. -Increased Security through rewound output, making sure important documents remain intact and in order. 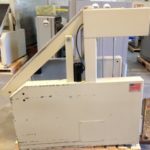 -Easy Roll Removal from print area to the finishing department. -Compact Design/Small Footprint saves valuable floor space while maintaining the highest performance and reliability. 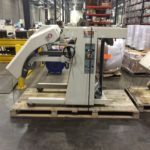 All equipment is staged and test prior to shipping unless otherwise specified. If however you prefer a refurbished remanufactured pre-owned ESP 300M Roll Rewind Processor, we can provide that too.